The government has an ambitious plan to tackle climate change and reduce carbon emissions. There is a target of 80% reduction in carbon emissions by 2050. In England and Wales, around 20% of commercial rental properties fall within the lowest two energy efficiency bands — namely, the F and G energy performance certificate ratings. There are around 4.6 million privately rented residential properties in England and Wales, which is around 20% of the total domestic housing stock. Up to 10% of those properties have an F or G energy performance certificate rating. An EPC is a certificate issued by an assessor, which shows information about the energy efficiency of the property to which it relates. An EPC should be made available when a property is being sold or rented out and when a new property is built, including when it is marketed and there are other circumstances that mean and EPC would be required. There are a few exemptions also. The general rule is that they are valid for 10 years and they are registered on the EPC register. The EU and the government believe that people will be influenced in their choice of property to buy or rent, by the property’s energy efficiency rating. I have just bought an old property with a rating of 12, which is an F rating!! 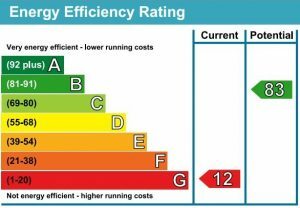 The good news is I am not renting it out so the new changes will not apply to me but it would not surprise me if there are further changes in future forcing owner occupiers to increase the energy efficiency rating of their properties. The bad news is I am not looking forward to receiving my energy bills this winter! b) A Tenant of a domestic private rented property can request consent to make improvements to the property and that consent cannot be unreasonably withheld. However, the minimum standards regulations recognise that there will be instances where it will not be cost effective, or indeed practical, to improve particular properties. Therefore, a number of temporary exemptions are provided to protect landlords. For example, landlords will not be required to improve a property to an E rating where planning consent is required and cannot be obtained. Landlords will also be exempt where there is independent evidence that installation of a recommended measure would damage the fabric of their property or reduce its value by more than 5%. In the commercial sector, Landlords are exempt where an independent assessor determines that all relevant energy efficiency improvements have been made to the property or that improvements that could be made but have not been made would not pay for themselves through energy savings within seven years. Similar cost-effectiveness tests exist for the residential sector. In all cases where a valid exemption applies, the regulations will require the landlord to register that exemption on a centrally held register, the exemptions register. A lease remains valid even if it is a sub-standard property. A more energy efficient property is better for the environment and should produce savings on energy bills, therefore they would be more attractive to potential tenants. Non-compliance could affect the value and the market rent. Where a local authority considers that a residential landlord may be in breach of the Regulations it may impose a fixed penalty or a penalty notice, or both. The penalty notice is published on the private rented sector exemptions register for at least 12 months. The maximum financial penalty for non-compliance in residential properties is £5,000. Civil penalties for commercial properties may be based on the rateable value of the property subject to a maximum cap of £150,000. In summary, in order to achieve a more energy efficient, cost effective building and to comply with the legislation when it comes into effect, landlords should be taking action now by assessing their buildings and planning for any necessary energy efficiency improvement works both practically and financially and reviewing their leases/tenancy agreements to establish their rights of entry under their tenancies for these kinds of improvements. Next Post Japanese Knotweed: What do you need to know?